Emmy Award-winning musician Peter Buffett has an acclaimed career that spans more than 28 years as a professional musician, composer, philanthropist and author. He began his career as the musical mind behind many of the early MTV bumpers of the '80s, and the climactic crescendo in the memorable "Fire Dance" scene in 1990's Oscar winning filmDances with Wolves. Buffett has received critical acclaim for his Native American-inspired music, most notably composing the full score for 500 Nations – the eight-hour Emmy-awarded CBS miniseries produced by Kevin Costner, and the musical production Spirit: The Seventh Fire – a Native American inspired show incorporating live native dancing, powwow singing and Imax-scale visuals (which premiered on the National Mall as part of the opening of the Smithsonian's National Museum of the American Indian in Washington D.C.). From 1987 to present, Buffett has released 15 records, and has been signed to such labels as Narada, Epic and Hollywood Records. He now owns two independent labels, BisonHead and BeSide Records. Most of his releases had been instrumental recordings until 2006 when Buffett began experimenting with vocals and a more eclectic pop/rock sound. His latest work combines elements of soft and progressive rock in the vein of Simon & Garfunkel and Beck. Buffett has collaborated with Grammy-nominated recording artist Akon as well as Grammy-winning artist Angelique Kidjo on human rights inspired songs, one of which debuted at a special event at the UN General Assembly. He is also the only man to have performed at Eve Ensler's 10th Anniversary V-Day celebration in New Orleans. Buffett's latest venture is his inspiring new book, Life Is What You Make It. Personal and revealing, instructive and intuitive, Life Is What You Make It is about following passions over conventions, transcending your circumstances or status, taking up the reins of your destiny, and living life to its fullest. 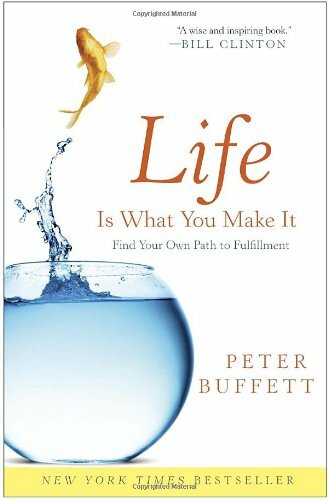 To bring the message of the book alive, Buffett has crafted Life Is What You Make It: A Concert & Conversation with Peter Buffett, a live music event that incorporates multi-media and personal stories to give the audience an authentic, inspirational, and impactful evening. Using his own life story and experiences as illustration, Buffett ultimately conveys that it's ones values-and what we are able to give back to society-that shape and define us as individuals. Buffett's integrity, candor and musical talent make for an uplifting and rewarding evening that resonates with every audience member looking to lead a more fulfilling life and leave a meaningful legacy.